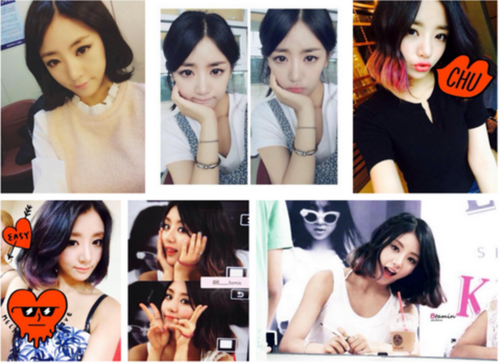 I’m sure everyone has heard the heartbreaking news that Go Eunbi (EunB) of Ladies’ Code is now deceased. The news has spread all over from Kpop news sites to general celebrity news sites, such as eonline.com and MTV.com. News is constantly being updated concerning the fate of members Kwon Ri-sae (Rise) and Lee Sojung. Lee Sojung is reported to be safely out of surgery and recovering, but Kwon Rise is still being treated in the Intensive Care Unit (ICU). I’ve heard reports that she has some dents in her skull or near her brain, so she needs all the prayers she can get now. Go Eun-bi was 21 years old (22 Korean age), which makes her one year younger than me. 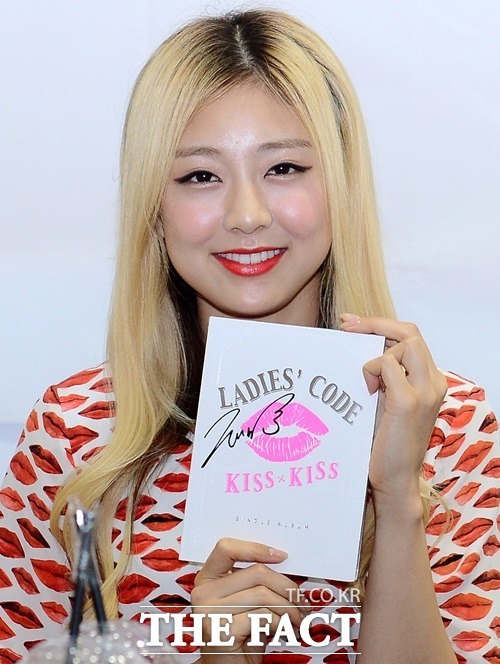 She debuted with Ladies’ Code back in March of 2013. The group was praised by many fans and I always heard that they should be watched as they would go far in the industry. Go Eun-bi is said to have even been in uploaded dancer covers to YouTube before her debut under the channel name ashleych0i. I have only heard one song from Ladies’ Code a while back, but I liked their style. I never even knew that my favorite member was EunB, until I saw her the way she looked when I saw her perform live. My heart sank when I read the news and the feeling becomes worse when I read how young she was now. It all feels like one big nightmare that I can’t wake up from. 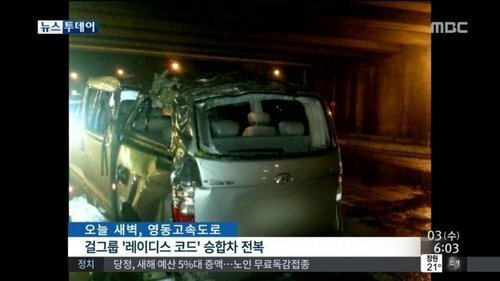 I first saw the news on Koreaboo.com, which told me that EunB had passed away after her team’s van slipped on a rainy road and crashed into an expressway wall. I understood that everyone else in the van was just injured and no one else had died at the time. I now know the driver also died and two of the members were in critical condition with head injuries. The rest of the members are apparently in great shock, which makes sense and Kwon Rise is still being treated for her head injuries. I know it is important for Kpop idols to make it to their appointments on time and I do not know if the driver was going faster to make it on time, but rainy weather makes driving dangerous. A car going too fast can ride the water and crash or skidding can occur with many other bad outcomes. I hate to hear of deaths, especially those of young people. People generally say the person was taken too soon and I have to agree this time more than ever. Go Eun-bi was more than just a young girl and daughter. She was an idol, which means she gave strength and hope to those who looked up to her. Some people don’t understand how valuable a Kpop idol can be in a fan’s life. They give us strength to get us through a bad day, a messy breakup or even a life changing event. These idols are seen as family members and role models to many fans. 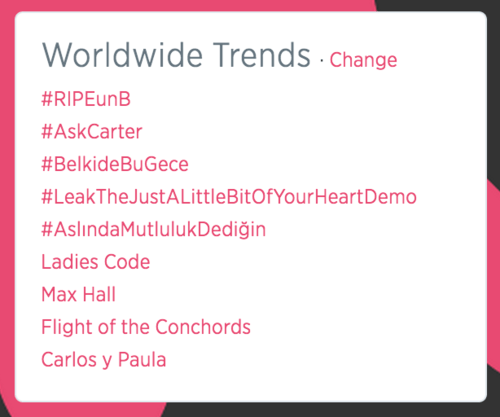 Their lives are precious for many reasons and this is why even non-Ladies’ Code fans are mourning. The picture above shows the team’s van after it crashed into the expressway wall. I read a comment from someone that said the van’s journey would have taken an hour and they hoped the driver wasn’t trying to make it in 45 minutes. I don’t recall their proof, but this is why I believe drivers for idols should be even more cautious than regular drivers. Rainy conditions mean a driver needs to slow down more than usual to avoid accidents. A entry on omonatheydidn’t.com says there was news that EunB was not wearing her seat-belt when the accident occurred, which resulted in her ejection from the car. I’m not going to turn this into a driving safety entry, but I must stress how important it is to wear a seat-belt when you are in a car. This is especially true when the weather conditions elevate the risk of accidents. She might have done that many times and nothing happened, but the risk is never worth it. I don’t know if wearing the seat-belt would have guaranteed her survival, but I believe it would have increased her odds. Fellow members Kwon Rise and Lee Sojung were taken to a nearby hospital with serious injuries and were in critical condition from the start, which prompted the doctors to begin surgery immediately. The reports of Kwon Rise and Lee Sojung in critical condition made me even more nervous because the worst case scenario would be additional deaths, which I kept telling myself not to think about anymore. I kept praying and I still am praying for their safe and full recoveries. Reports eventually came out that Lee Sojung had stabilized after about seven hours in surgery, but Kwon Rise stayed for nine hours and was taken to the ICU for further treatment. A live update was set up on Koreaboo.com to see the condolence tweets that were coming in for the members of Ladies’ Code and those connected to them by other celebrities. Some of these celebrities are miss A’s Suzy, Kahi, Dal Shabet’s Soobin, Fly To The Sky’s Brian Joo, Brown Eyed Girls’ Jea, Meagan Lee, G.NA, GOD’s Joon and Arirang TV’s “After School Club” to name a few people. Naturally, Polaris Entertainment issued a statement once they were able to gather more information and take in the situation. The statement says the members were returning from their scheduled activities when the back tire of the van fell out. It goes on to mention the status of Kwon Rise and Lee Sojung as well as a wish for fans to pray for the members. The location of Eun-bi’s funeral had not been decided yet. I don’t know how vehicles work exactly, but I hope it wasn’t because of improper maintenance or the speed traveled caused the tires to come loose. Regardless of how the tire came loose, I have prayed for Eun-bi to rest in peace and for the full recoveries of those injured. A singer by the name of “Eru” tweeted about this type of situation concerning schedules and how labels need to have their idols’ safety on their minds first. His tweet was translated as saying “If you are to assign them a hectic schedule, you must take take good care of them. The safety of those who are assets to your company should be more important than their schedules. No matter how bothersome it may be, you must always check the condition of the car being mobilised and the driver who is to drive. To all the managers in the entertainment industry.” I still don’t know the details of what happened to cause the tire to get loose, but I still believe something could have been done to make that trip safer. I know I’m mentioning prayer a lot and some people might not believe in prayer, but well wishes are fine too. That’s just what I do and this is especially true during tragic moments. This is a time when I believe Kpop fans show we are one family. It’s true that we bicker and fight over our idols, but they are all precious to us and we support one another. It’s a shame this is only seen during times like these, but the proof is there. 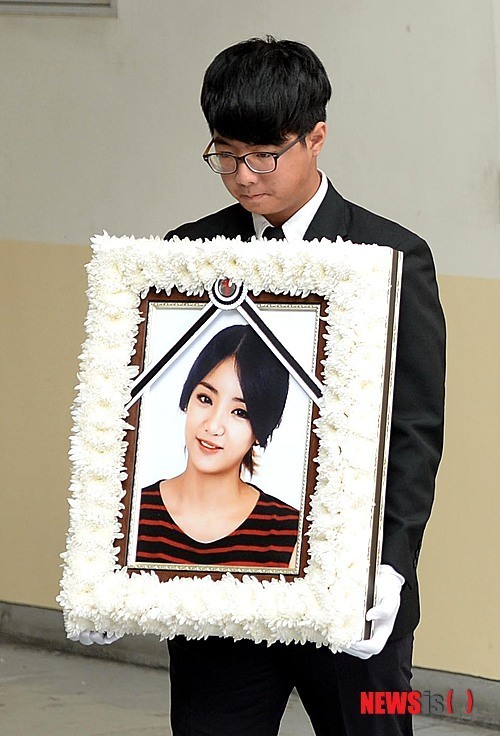 Fans all over used the hashtag “RIPEunB” to express their condolences on social media, which helped the hashtag become #1 on Twitter shortly after the news broke and soon on Facebook as well. Some tweets or Facebook comments show some mourners did not consider themselves fans of the group, but the news still broke their hearts. This is what I am talking about here. I liked Ladies’ Code and EunB was my favorite/bias in the group, but I never felt I knew them enough to be considered a fan. Maybe a new fan, but the point is you don’t need to be a fan to mourn her death. You don’t even have to know much about Kpop to mourn Eun-bi’s passing and support is vital now. Family, friends and fans need strength to get through this tragic event now more than ever. I still choke up and begin cry a bit when I think about it. I recall the live footage of her smile and the group being happy together, then this news comes to mind and I can’t keep all the tears in. It’s fine to cry too and it’s not something to be ashamed of either. I hear news of people mocking mourning fans and even some nonsense with a fortune teller predicting an idol’s death this year. Why is being respectful so hard for some people? I don’t care if you consider yourself a “hater” or “anti-fan”. You are a jerk and a disrespectful wretch, as well as a pathetic attention-seeker. If you are not going to express condolences or wish the members well, then just KEEP YOUR MOUTH SHUT AND YOUR THOUGHTS TO YOURSELF. It’s not funny to mock someone’s death and ridicule the pain of others. That is just sick, but I ask fans to focus on showing the members of Ladies’ Code and those close to them your support. The hospitals refused to give out information on Kwon Rise and Lee Sojung when they were operating and some information might never be released, but that’s not important. It’s understandable and we should focus on showing our support. This proves another important point in the Kpop world. IDOLS ARE HUMAN JUST LIKE US AND THEY HAVE FEELINGS TOO. One of the most ignorant things I have ever heard about Kpop idols was that they decided to become celebrities, so that means bashing them is just part of the natural order. This is PURE IGNORANCE and plays on a double standard, which a lot of people often complain about in their own lives. It might be a different double standard, but that doesn’t matter to me. These idols see the hurtful comments, even if you are commenting on YouTube videos or your personal blogs. They see reaction videos and their feeling can be hurt. Go Eun-bi was a celebrity, but she was also a young woman who went through life’s challenges like the rest of us. She’ll never get to fall in love with a man, marry him, have a family of her own or even just experience the many things life has to offer. Life doesn’t need any help making itself difficult for everyone, so don’t make things harder for these idols. Now is the time for unity and that is how it should be all the time. Ignore and block the cruel people who would mock this situation and those who are mourning now. Those individuals just want attention, so don’t give it to them. It was recently revealed that Eun-bi wanted to spend Chuseok with her family. Chuseok is also called the “Korean Thanksgiving” and it is a time when families gather to celebrate the harvest as well as visit ancestral hometowns, according to old traditions. I mostly see news of families gathering to celebrate their family, remember those who have passed and even visit the graves of deceased loved ones. Eun-bi expressed her desire to be with her family, since she is not able to see them often. That is a common trait in a Kpop idol’s life and it is hard to bear, even with family support. She is quoted in a Koreaboo.com article saying she believed that “the little things in life are the happiest.” EunB is remembered as an idol who loved her fans, also known as a “fanbabo”, and this was recently echoed by a reporter. The narrative can be read here. It talks about EunB’s love for her fans and talking about girls’ feelings through songs like ‘Bad Girl’ and ‘Pretty Pretty’. It concludes saying that EunB can no longer be on stage, but she will be remembered for her time there. That is important for everyone to remember too. Remember Eun-bi for the sweet young woman who loved her fans and brought joy to many people. I will conclude by saying that I am extremely sad at the passing of Go Eun-bi and I will keep praying for Kwon Rise and Lee Sojung to make full recoveries. I hope all the members, families, friends and fans involved can rely on each other to get through this tough time together. Some people will never recover because of how important Eun-bi was to them, but they can always rely on those who feel the same. I pray that Kwon Rise and Lee Sojung don’t encounter any problems later on in life from their injuries and I hope that Go Eun-bi is resting peacefully. Heaven has a new angel in Go Eun-bi and fans will help her live on in memory. Be respectful and don’t forget the wonderful angel that is Go Eun-bi. My deepest condolence to the family of Go Eun-bi. May she Rest In Peace (R.I.P). *This is the YouTube channel with Ashely (leader of Ladies’ Code) and EunB (vocalist). Update: (1) Go Eun-bi’s funeral will be held on September 5th. Polaris Entertainment, announced that her vigil/wake will be held at Korean University Anam Hospital until her funeral on September 5th. (2) Lee Sojung will be going for surgery for her fractures, Kwon Rise is out of surgery and being observed closely and Ashley, as well as Zuny, is being given seperate treatments to deal with their state of [great] shock. 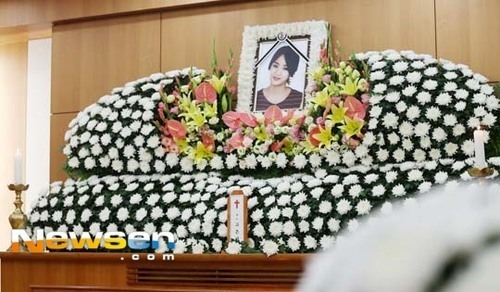 (5) According to Koreaboo.com, Dispatch revealed Eun-bi’s mother broke down at her daughter’s wake and said “Only today, I cry. I hope you’re happy forever.. Goodbye. It’s okay to smile [while] thinking of me sometimes. I’m fine, thank you. Thank you.” This seems to refer to the idea that one should not mourn the dead, but celebrate that they are in a better place. Of course a mother would cry at the wake of her young daughter, but these are words that imply Eun-bi’s mother is going to try to be strong. Eun-bi’s mother also showed concern for RiSe and believed Eun-bi would watch over her before leaving. *Opinion: I was always told that no parent wants to bury their child and I have always believed that. I know Eun-bi’s mother is sad and it should not be surprising. I have constantly said on social media that I believe Eun-bi is like a guardian angel to the other members now and I believe her spirit will help RiSe recover. (6) A 14 point summary was developed by Dispatch to follow the story. It includes the initial accident and developments, such as Sojung and RiSe’s condition. It is noted that RiSe planned to spend Chuseok (Korean Thanksgiving) with her parents in Hong Kong. Her parents live in Japan, so she does not get to see them often. The ‘KBS Open Concert’ was the event the group was returning from the day of the accident and there was nothing reported to be scheduled afterwards (no hectic schedule). (7) Eun-bi will be cremated at Skycastle Memorial Park after her wake and funeral. 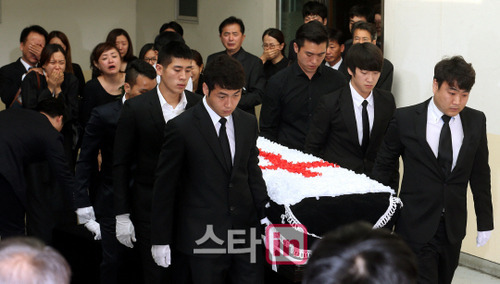 Eun-bi’s family attended her funeral, which was held at University Anam Hospital Funeral Hall. It is reported that the coffin rites were done in a “traditional Christian manner”. (8) Hospital officials are focused mostly on the condition of Kwon RiSe. I have read somewhere that the phrase “hanging by a thread” was used to describe RiSe’s condition at one point. RiSe has yet to regain consciousness and I’ve read it has been a full 24 hours now. She remains in the neurosurgical section of the Intensive Care Unit (ICU). The doctors at the hospital said the main issue is RiSe regaining consciousness and stressed how important it is that her surgery had to be interrupted. I read it was due to low blood pressure and she had to be resuscitated by hand at one point. *Opinion: RiSe’s condition is shaky and lots of prayers/well wishes are needed. I have been constantly praying and the hashtag “#PrayForRiSe” is used to show support for her. (9) Dispatch got photos from Eun-bi’s funeral and it should be known that these will be emotional, which means you should expect your emotions to be stirred. I know some people feel Dispatch should not have taken photos and that belief is fine. However, I am glad the family allowed them to take photos because some of us wish to see her being sent off. No one has to agree with that belief, but I am glad because my heart is still broken over the passing of Eun-bi. *Note: The girls with the neck braces and bandages on their hands to wrists are very likely to be Ladies’Code members Ashley and Zuny. (10) Eun-bi’s mother urged members Ashley and Zuny to stay strong and never give up. She also told Ashley she would be her “Korea mother” because her real mother could not be there. Sojung completed her new facial surgery and is receiving treatment in a separate area than the one that held Eun-bi’s funeral. According to an article on Koreaboo.com, Sojung began to be suspicious that something bad had happened when she asked visitors from her label the question “Why is everyone coming to visit me all in black?”, but she stopped asking soon afterwards. It is suspected even she knew the truth would be something she could not handle at the time and that is likely to be true. *Opinion: I believe Sojung knows someone died in the accident and I would even go so far as to say she knows or heavily suspects it is a member of Ladies’ Code. I would not see how she could suspect a specific person, but I do believe she knows a fellow member has died. It will be a terrible revelation to her when she is told that Eun-bi has died. 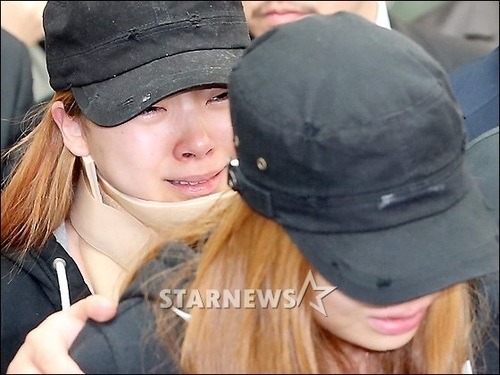 (11) Ladies’ Code members Ashley and Zuny were readmitted to the hospital recently for more treatment. Neither member has made a full recovery yet, so this is an expected development. Sojung is in stable condition and there is little worry her condition will worsen. However, RiSe has still not regained consciousness after her surgery and most of the concern revolves around her. I’m asking everyone to continue to pray for RiSe, which is echoed by Eun-bi’s mother as well. (12) New reports from first responders is out. Eun-bi was NOT ejected from the car as previously believed. She was found unconscious inside the car beside RiSe and Sojung. One of the front tires was also found to be heavily bent out of shape. RiSe was found bleeding from her head and she had no pulse, which required first responders to perform CPR on her immediately. Additonal pictures have been released and can be seen here. (13) It was also recently revealed that Sojung had known about Eun-bi’s passing before her facial surgery. She was able to deduce someone passed from how her visitors were dressed and she was healthy enough to search for articles on her cell phone. It seems Polaris Entertainment did not cover every possible scenario for her discovering the truth. Sojung was shocked at first, but she is slowly gathering herself. *Opinion: I figured Sojung would figure it out from people visiting her in their mourning clothes. I didn’t know that no one took her cell phone from her. If I knew that, then it would have been more obvious that Sojung would know exactly who had died. RiSe is still in the ICU and no new information has been released about her regaining consciousness yet. (14) Heartbreaking news has been released. Kwon Ri-sae (RiSe) has died at the age of 23. Time of death was recorded at 10:10AM on September 7th. RiSe’s was reported with low blood pressure at one point and she has succumbed to her injuries. *Note: I will edit the title to be in memory of Go Eun-bi and Kwon Ri-sae. Heaven has a new angel and my condolences to her family. May her soul rest in peace. Ashleych0i was owned by Ashley. Not by EunB. I’m aware of that, but I mentioned what I had heard, which was that she was in the uploaded videos on that channel.